If there are any Sony Ericsson Xperia X8 owners out there that are bemoaning the lack of run time on their handsets, then you’ll be glad to know that Mugen Power has released a couple of extended batteries that should keep your X8 running a little longer. Mugen Power are stocking two batteries, one has a 1300mAh capacity (slightly above the stock 1200mAh battery) and costs $44.95. The second is double the capacity at 2600mAh and will set you back $96.95. Given the size, it comes with its own housing that will mean a bulking out of the chassis, but should be ideal for those that find themselves on the road often. If you want to know a bit more about Mugen Power, check out our review of the X10 batteries here. Just seconds,.. damn.. oh well,..2ND! Surely its more sensible just to carry a second battery around than install the massive 2600mAH one. Probably far cheaper as well. Why man why! Why didn’t you release this news earlier, I just bought a mini pro. It would be amazing it I had bought the X8 because now it has 2.1 and this amazing 2600 mah battery !! God who though that SE will release the update a month earlier and that mugen power would make a bettery for the X8 this soon. Damn it seems the X8 is a really good android device after all. It’s only weakness is it’s battery, other than that is has it all, the price, looks, os, battery, all are good. 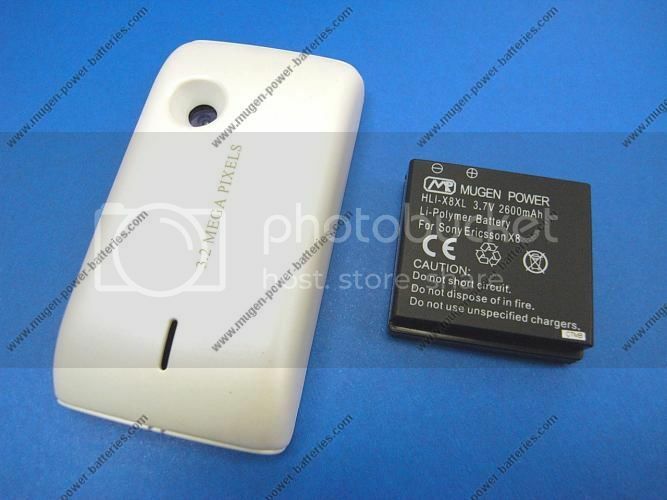 Hello, Mugen Power just released the 1300 and 2600mAh Extended Battery for Sony Ericsson X8, cool! when come to Indonesia? is there any for x10 mini? Previous post: Sony Ericsson MW600 competition winners announced!